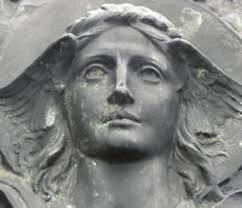 Detail of the carving of the Virtue, Prudentia. 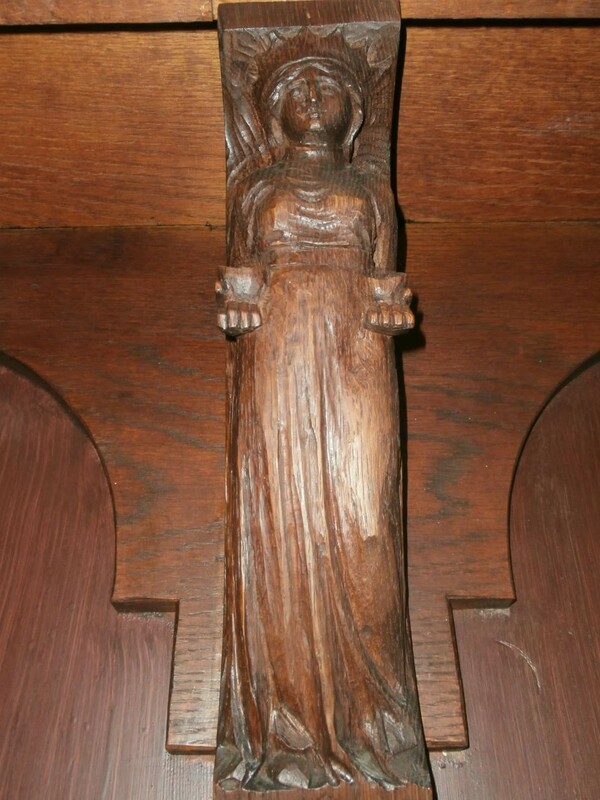 ‘The Four Virtues’ were commisioned in 1922 by Miss Louisa Mary Gurney, M.A., B.Sc., Newcastle High School’s 3rd and (prior to the appointment of Hilary French in 2014) last Headmistress (1902-1934) as the School Jubilee History makes clear (P.44). 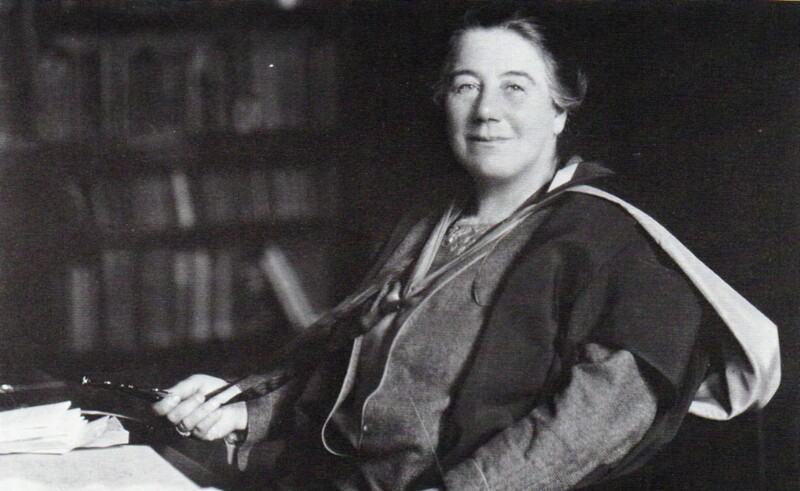 Described in the Oxford Dictionary of National Biography as an ‘educationalist’ not just headmistress, she had plans in 1918 to expand Newcastle High School for girls along the lines of Cheltenham Ladies College. Although her bold boarding school vision was not passed by her Governors, she instead created a House System in an attempt to foster similar values in her NHS girls. 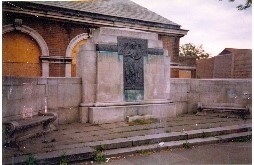 Because of this history, we know that the four House Brackets predate The Newcastle Upon Tyne Church High School (created after decentralisation from The Church Schools Company in 1925) and were in fact an integral feature of the original Newcastle High School for girls on Tankerville Terrace, having been designed especially for the South wall of the Main Hall. 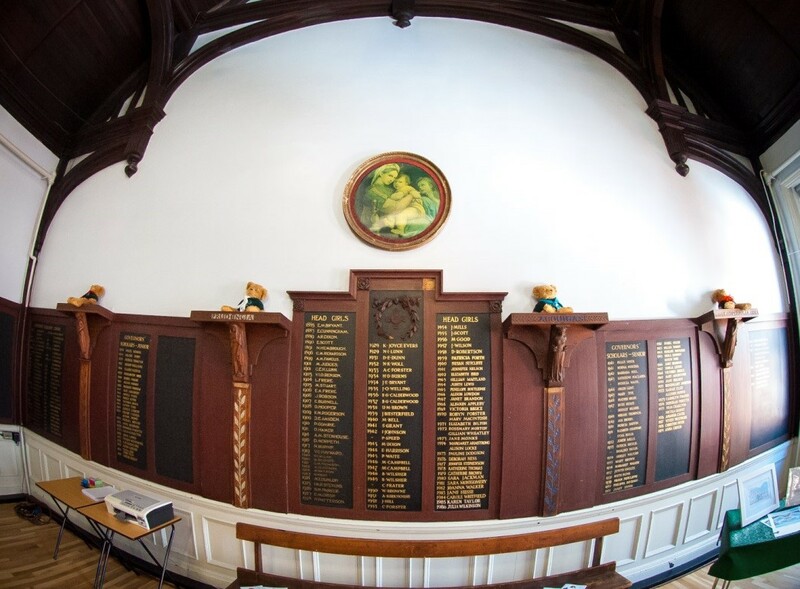 The Four Virtues Brackets in situ as part of the Honours Board created for the NHS Hall South wall. 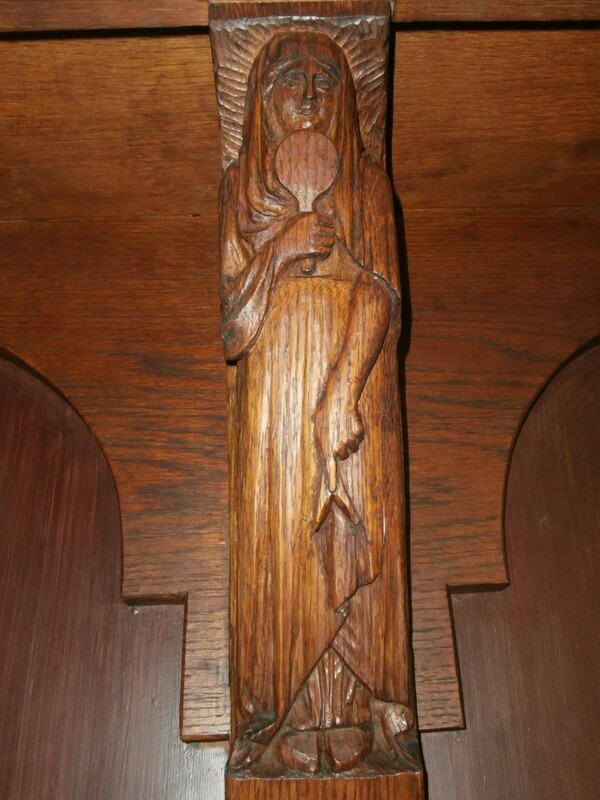 I always knew the carvings were of high quality, however, until I did some research recently I did not know that they could even be attributed to a specific sculptor, nevermind one of note. 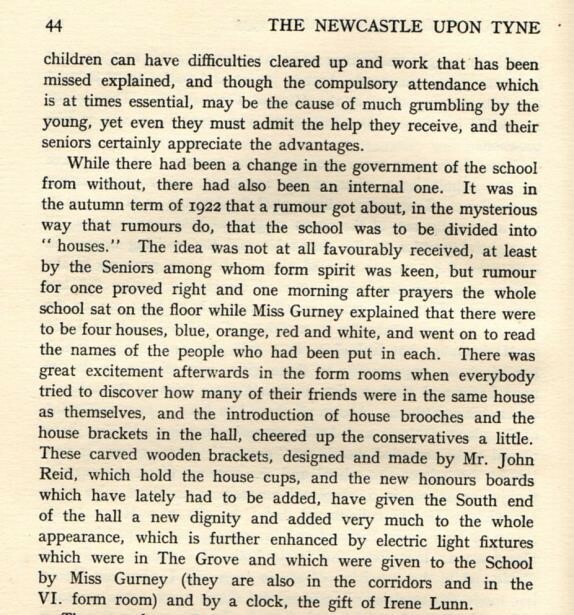 The brackets are mentioned briefly in the House reports of the Newcastle High School magazine for 1922-23 (No 44, in the Tyne & Wear Archives at the Discovery Museum [*See Appendix]) but it was not until I checked the history again that I realised they were actually attributed to the sculptor, Mr John Reid. 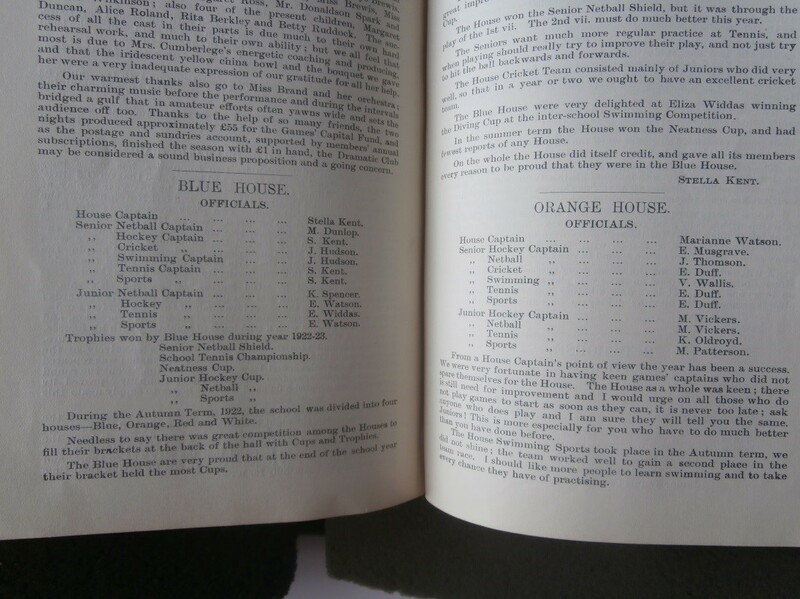 Unlike the Church High and Central High Houses, the Newcastle High School Houses created in 1922 by Louisa Gurney were known by colours: Blue House, Orange House, White House and Red House. 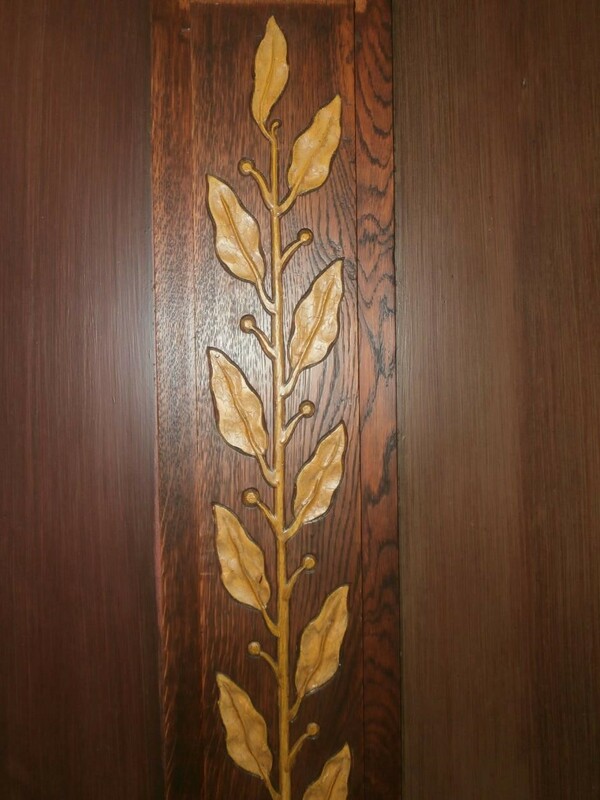 The sculptor chose to reference the House colours in the lettering on the edge of each carved bracket and in a separate carved section which ran beneath each bracket: a strand of leaves. 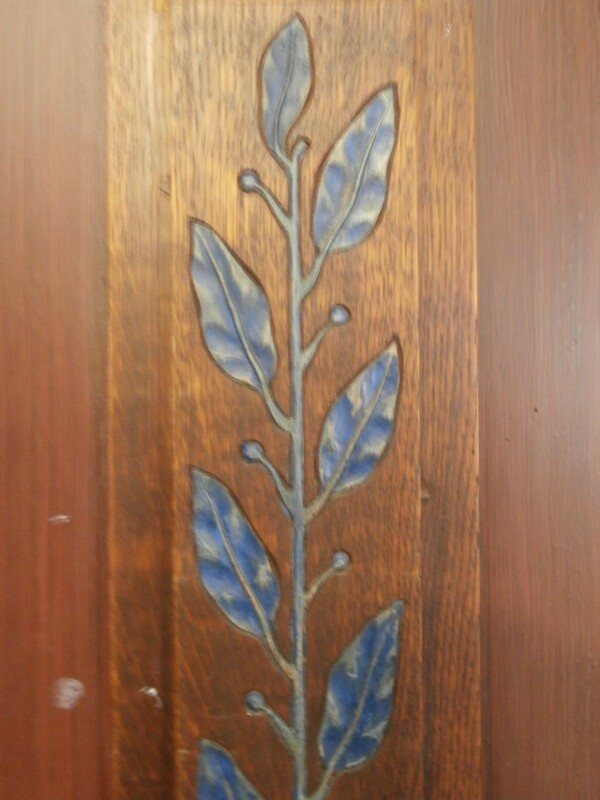 Designed to be in keeping with the NHS Hall’s beautiful wooden Arts & Crafts hammer-beamed ceiling (1889), the brackets were also sculpted in the Arts and Crafts style. It is probably only owing to the fact that the name of the sculptor has been so hard to find that both the Hall ceiling and the Medieval style carved House Brackets are not listed in Barrie and Wendy Armstrong’s book The Arts and Crafts Movement in the North East of England: A Handbook (Oblong Creative Ltd, 2013). The painted carved lettering on the four brackets makes it clear that each House at Newcastle High School was allocated one of the four Cardinal/Classical Virtues as their role- model (the cardinal virtues being so called because they are regarded as the basic virtues required for a virtuous life) – Blue House: Aeouitas (Justice); Orange House: Temperandtia (Temperance); White House: Prudentia (Prudence) and Red House: Fortitudo (Fortitude). 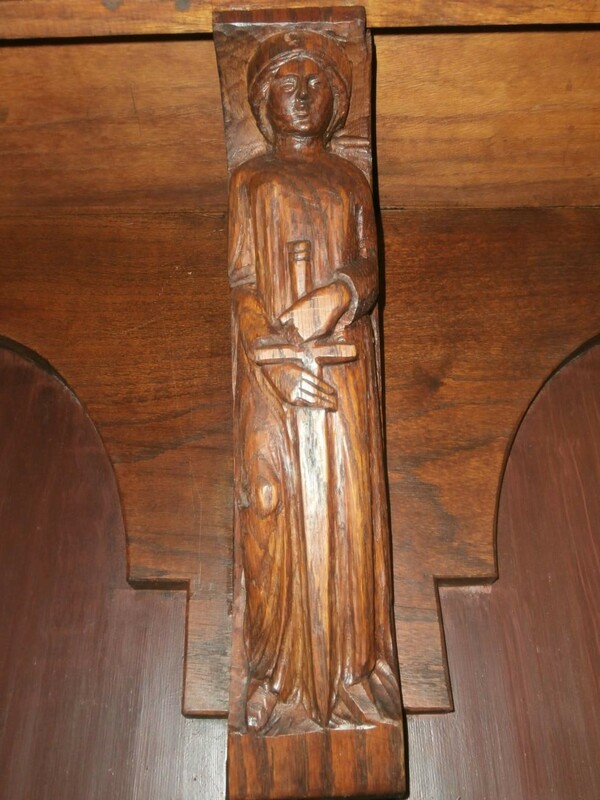 Knowing now that Louisa Gurney commissioned John Reid to design and create the brackets, I was curious to know more about him and soon discovered via Google that he was a well-known sculptor. His connection with Miss Gurney was a local one and she most likely met him through her father. Henry Palin Gurney, Miss Gurney’s father, was an eminent man of Science at the time who studied at Clare College, Cambridge, where he specialised in science and mathematics and also studied mineralogy and crystallography under Professor William Hallowes Miller, acting for a while as Miller’s deputy. Gurney became senior lecturer at Clare College in mathematics and natural sciences. In 1894 (nine years after the foundation of Newcastle High School for Girls and four after the move to Tankerville Terrace) he was appointed to the post of principal of the Durham College of Science, Newcastle-upon-Tyne. In 1901, at Gurney’s suggestion, the Armstrong Memorial Fund was devoted to the completion of the college, as a memorial of Lord Armstrong. The college thereupon took the name of Armstrong College. 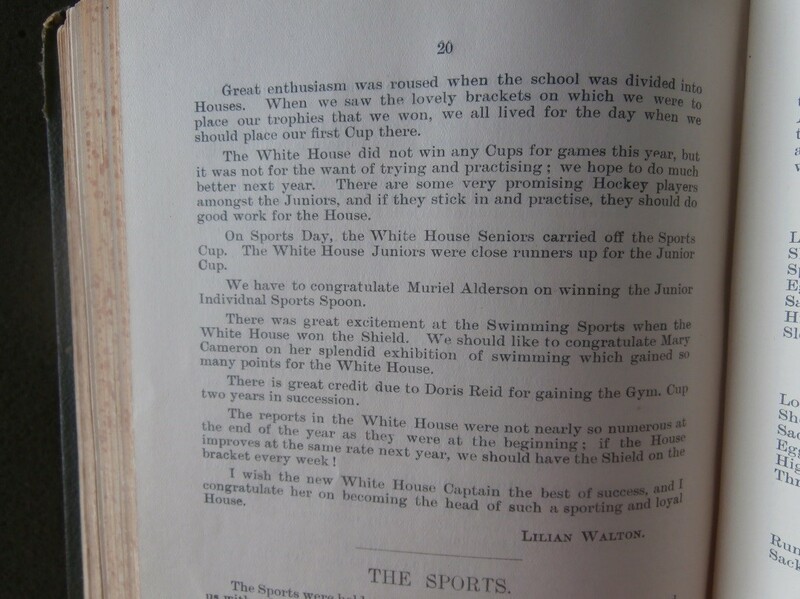 The new buildings were duly commenced in 1904. Henry Gurney had 9 daughters, Louisa being the eldest. As such, she is mentioned in her father’s Wikipedia biographical entry: ‘He left a family of nine daughters; the eldest, Mary, is head mistress of the Newcastle high school for girls’. 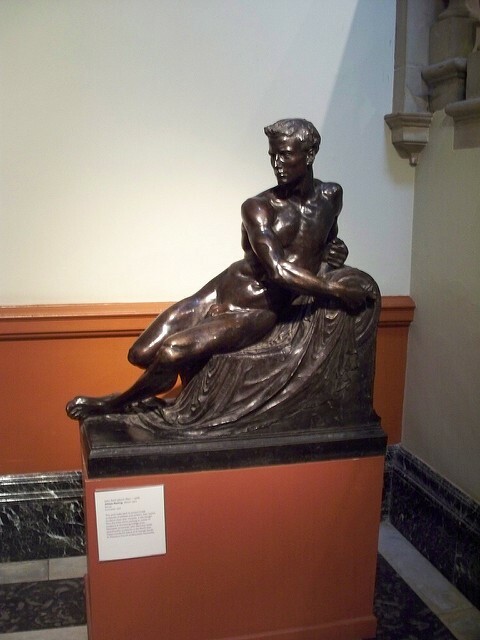 There is a bust of Gurney by Mr. C Neuper in Armstrong College library and an oil painting by A. H. Marsh in the hall. The College of Physical Science was founded in 1871 offering instruction in mathematics, physics, chemistry and geology to meet the growing needs of the mining industry; it became the Durham College of Physical Science in 1883 and was renamed Armstrong College in 1904. Both institutions later became part of the University of Durham, consisting of two Divisions, Durham and Newcastle, on two different sites. The Newcastle colleges merged to form King’s College in 1937 and in 1963 became the University of Newcastle upon Tyne. 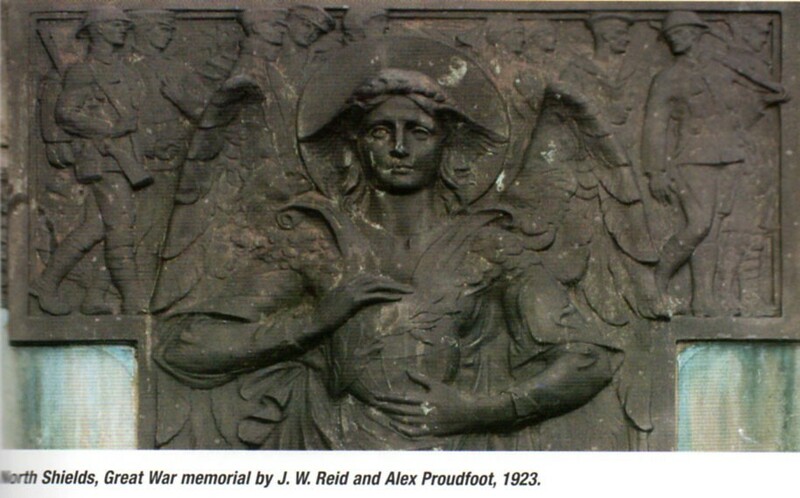 A Google search for a sculptor named John Reid brought up a link to the North East War Memorials Project where a John W Reed is recorded as being Professor of Sculpture at Armstrong College of Art, Newcastle, which would directly connect him to Louisa’s father. 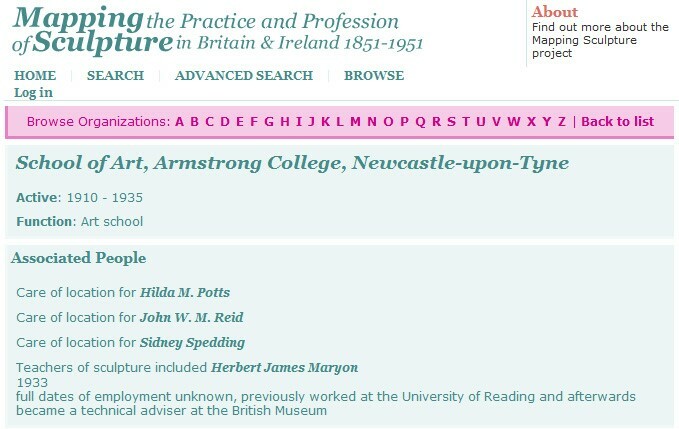 A search for the Armstrong College of Art brought me to the website of Glasgow University’s History of Art Department where the dates of the School of Art at Armstrong College were given as 1910 to 1935. In its middle period, the location was in the care of John W.M.Reid. 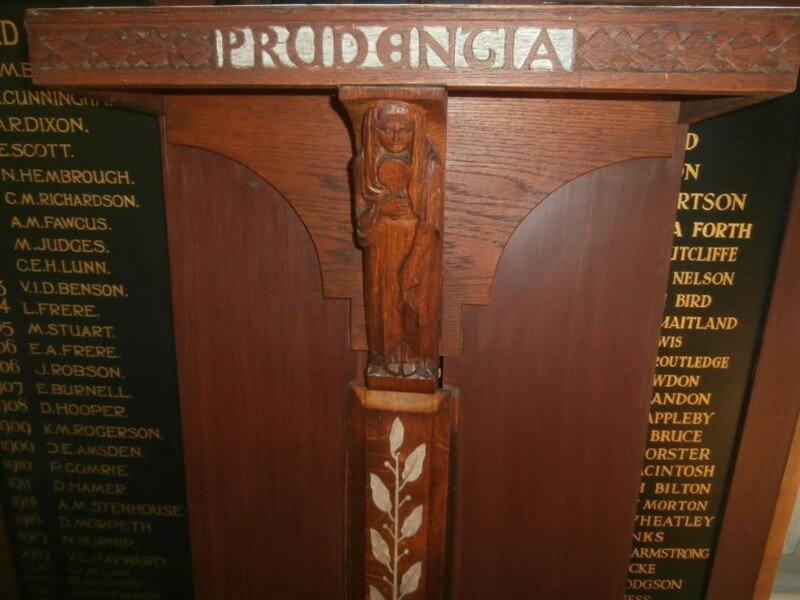 This placed a Mr John Reid at Armstrong College School of Art in 1922, when the Newcastle High brackets were installed, but a discrepancy over the spelling of the surname remained. The next pieces of sculpture John Reid was to create were all public commissions, commemoration war memorials for those who fell in the First World War (1914-1918), very fitting as he himself had survived active war service. He knew the subject he depicted well. 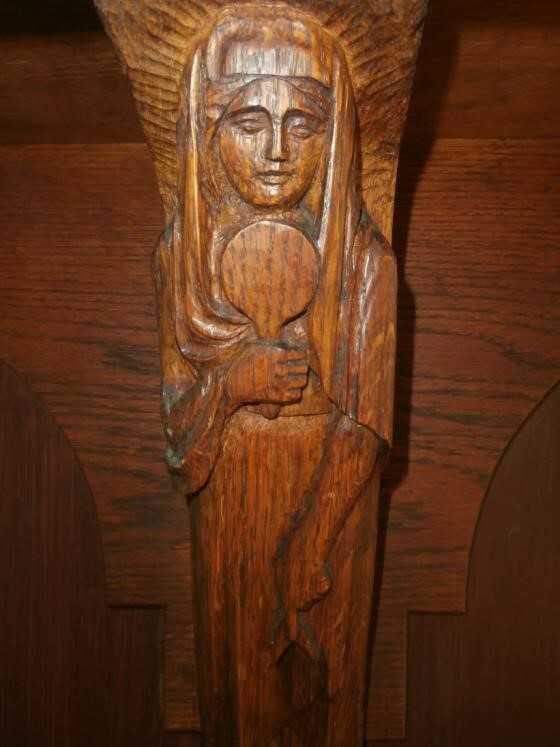 John Reid is credited in The Arts and Crafts Movement in the North East of England: A Handbook with 6 memorials in the North East in the early 1920s- The Great War Memorial, Choppington [NZ255842](Art Nouveau Angels, 1925); The Woodhorn Colliery Disaster Memorial, Hirst Park, Ashington [NZ288884] (Deputy holding a miner’s lamp, 1923); 6th (Territorial) Battalion of the Northumberland Fusiliers Memorial] by St Thomas’ Church, Newcastle [NZ248648 (bronze St George and the Dragon, 1924); the North Shields War Memorial, Hawkey’s Lane [NZ348686] (bronze-relief Angel of Healing and Peace, 1923); The Great War Memorial, Craghead (winged angel in white marble, 1922); The Great War Memorial at St Paul’s, West Pelton, Chester le Street [NZ232531]. 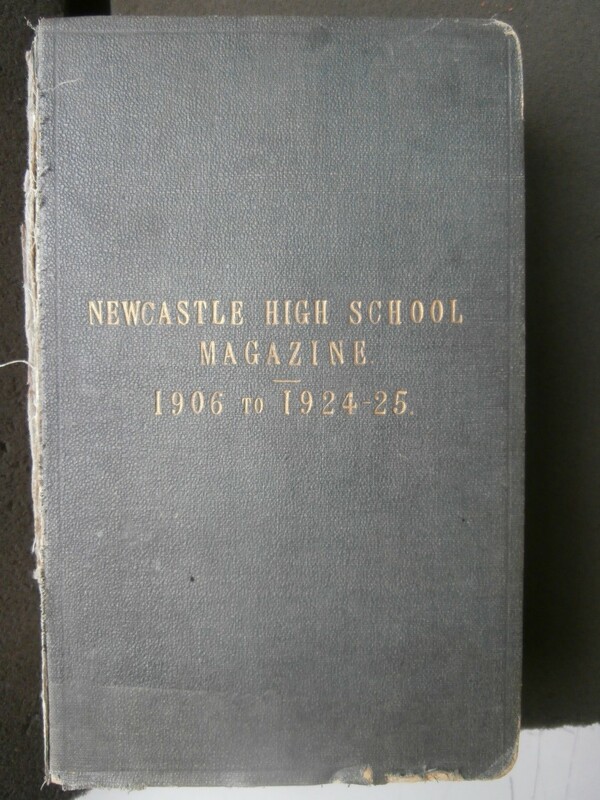 The Armstrongs also provide much helpful information about the Arts and Crafts Movement in Newcastle at the turn of the century around the time when the Newcastle High School for girls building was under construction on Tankerville Terrace for the Church Schools Company. They note that, although the Movement in most descriptions is considered to be a London and Home Counties phenomenon, the ideas ‘arrived in the North East by ways of the writings of prominent and respected men in the fields of the arts and architecture.‘ Most significantly, they observe, ‘ideas came from architects, artists and craftsmen moving out from London to work in other parts of the country and taking with them the ethos of the Arts and Crafts Movement’. 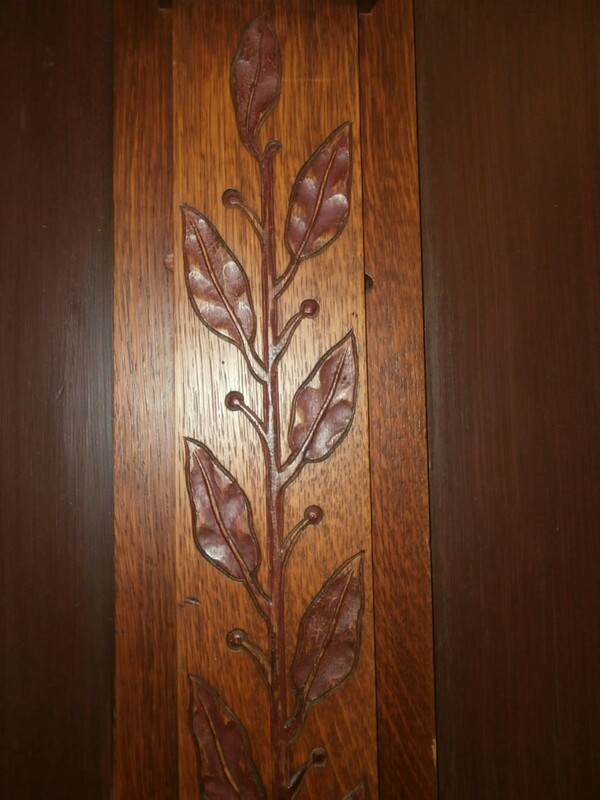 It is by this route that the Arts and Crafts influences are likely to have arrived in 1889 on Tankerville Terrace, via the architect R.J. Leeson, and resulted most notably in the fine wooden hammer-beam Arts and Crafts ceiling of the Main School Hall. In the Introduction to their Handbook/Gazetteer, the Armstrongs acknowledge that the words ‘Arts and Crafts Movement’ rarely, if ever, occur in the contemporary architectural literature of the North East. 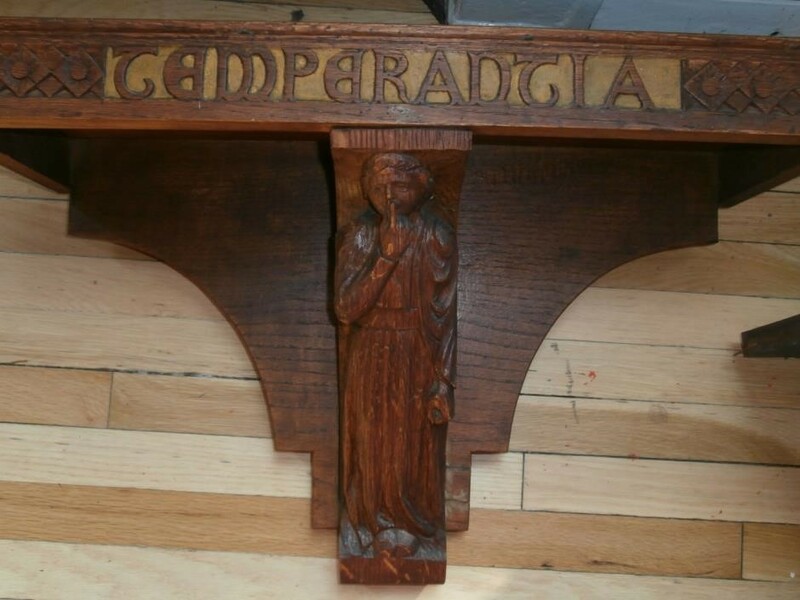 Their yardstick as to the local architects who were advocates of the Movement’s ethos and whose work exhibited Arts and Crafts tendencies is via support of the Northumberland Handicrafts Guild. All of these architects were also members of the Northern Architectural Association based in Newcastle. In their Introduction’s reference Notes, Note 17 on Page xxxiv informs us that in Newcastle at the turn of the century these supporters were W.S. Hicks, W.H. Knowles, R.J. Leeson and A.B. Plummer. All were likely to be familiar with ‘The Principles Underlying the Handicrafts Movement and Their Influence on Architecture.’ On Page xvii of the Introduction, three firms of architects working at the start of the Twentieth Century are also cited by the Armstrongs as leaders in this field: Frank W. Rich, Benjamin F. Simpson and the firm of Oliver, Leeson & Wood (the final form of the architect’s firm behind the build of Newcastle High School for girls on Tankerville Terrace). According to the Armstrongs, ‘All three had a particular penchant for giving their large, commercial buildings copper-clad domes and idiosyncratic dormers which all contributed to making Newcastle such an interesting city architecturally.‘ The west section of Newcastle High School Hall roof originally had dormer windows to allow light into the upper section. According to the Armstrongs’ Handbook, the architect Richard John Leeson was indeed a southerner, born in Norwich. From the 1871 Census we know he was articled to a London architect and, in 1879, went into partnership with Thomas Oliver in Newcastle. The firm became Messrs. Oliver & Leeson. We know from the School history, p.17, that in June 1888 ‘Messrs. 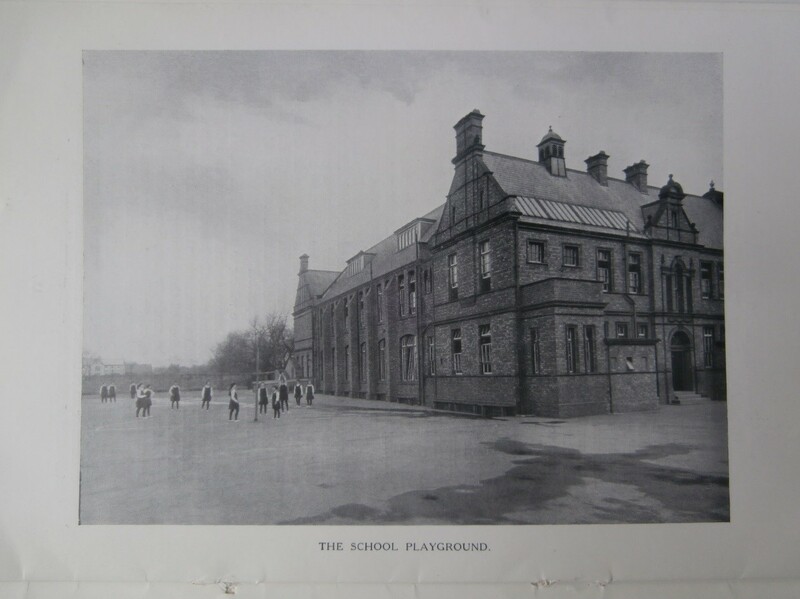 Oliver & Leeson were appointed architects, and their plans were approved shortly afterwards’ and that although the progress of the building does not seem to be recorded, the foundation stone was laid on May 23rd 1889. The Armstrong Gazetteer’s ‘Who’s Who’ on Page 213 describes the firm of Oliver, Leeson & Wood as ‘one of the most dynamic in Newcastle with a huge output which included buildings of great originality of style. The work encompassed: the building and restoration of churches; schools and colleges; hospitals; office blocks; warehouses and banks’ (Ref: The Builder, p.85; Tyne & Wear Archives). John Reid’s bronze sculpture of St George in front of St Thomas’s Church, Haymarket, is a Grade II listed work of art. 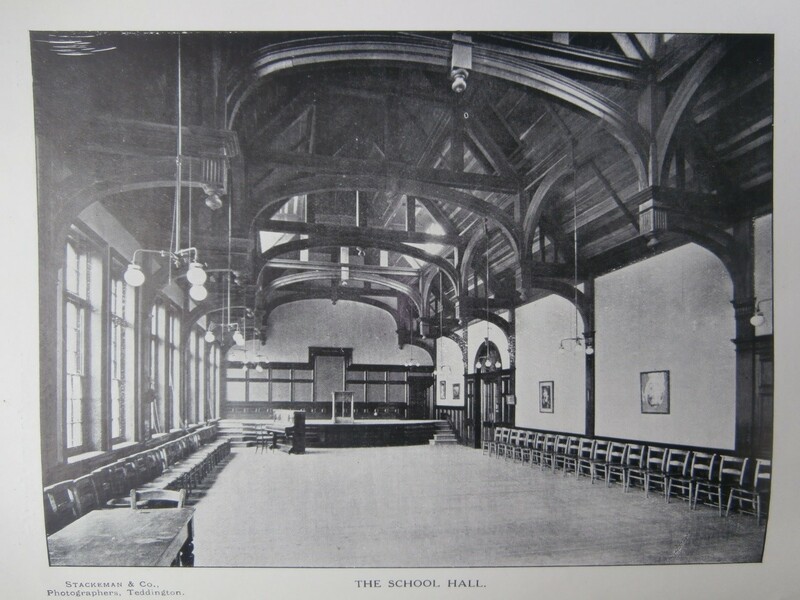 Whilst I know the Newcastle High/Newcastle Upon Tyne Church High building and Hall ceiling woodwork are not officially listed, both are undoubtedly the work of Richard Leeson. At present, the Newcastle High School House Brackets are in a storage unit with Quicksilver Removals and Storage in Ponteland with the other artefacts of value removed from the building before Tolent took possession of the site in September 2014. Because of this, I have not been able to check them for any signature or sculptor’s mark which would prove without question that they are designed and created by John Reid. Unfortunately, when I took my photographs of them being dismantled in August 2014, I was not fully aware of their value and so did not think to look. I just knew they were beautiful. Hopefully, however, my research presented in this essay will now enable others to discover more about the value of both as historical artefacts and features of regional significance. 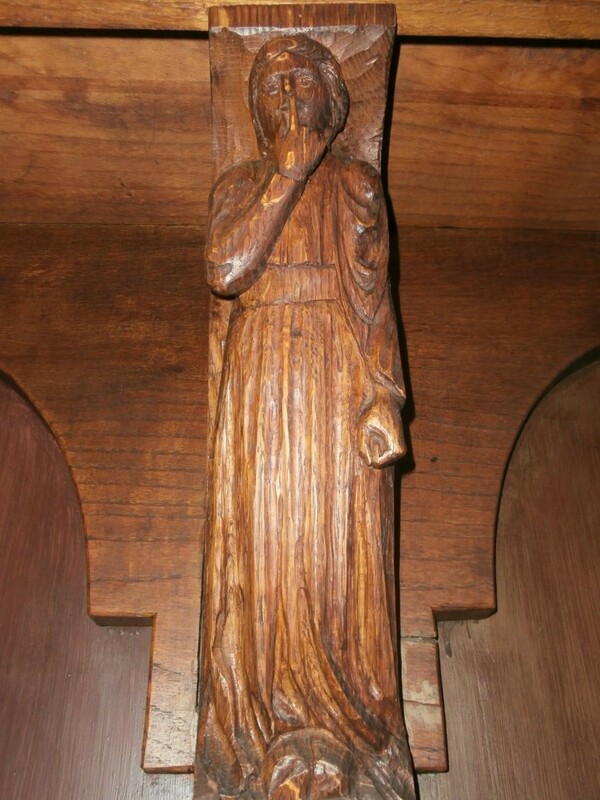 Having talked with EWA’s Director, Mark Evans, on the January 13th Site Tour, I know that he and his team – and I am assuming GDST too – are not aware of the existence of any original Newcastle High School woodwork. 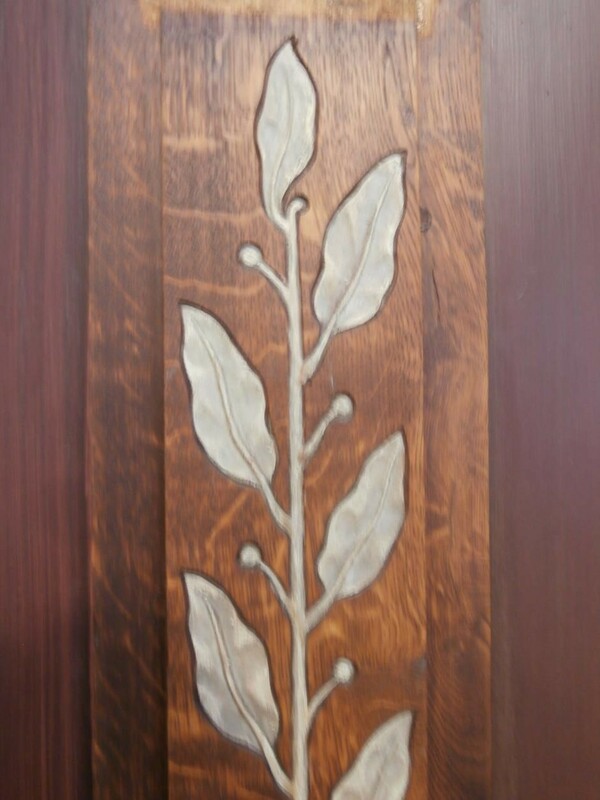 Mark expressed a keen interest in it at the time asking if any images could be sent to see whether it was possible to work it into the design when internal decoration was being considered (perhaps it has already been discussed?). On this subject, I must also say that I have been very saddened to learn via a conversation with Nick White at Wates that a decision has now been made to paint the Arts & Crafts Hall ceiling white. It was this news which prompted me to undertake this research at Easter. I am aware that, personally, I have no right of input into decisions of this nature. However, I am hoping that the time, effort, academic research and passion I have put into discovering more about the cultural/historical value of the wood we are dealing with here might allow me to introduce some new information into a dialogue- even at this late stage – which has huge importance for many, many people who have a connection with the Tankerville site. Since three small period fireplaces (hidden away for years) are being lovingly preserved and incorporated into the new design, it is hard to fathom why the building’s key feature is not being treated with the care and respect it merits. A lot of people will be very upset indeed. I feel it is now the time for a conversation to take place as to whether there is a place within the new Newcastle High School for Girls building for items connected to its celebrated past or whether the artefacts of greatest artistic value should instead be offered to a museum.